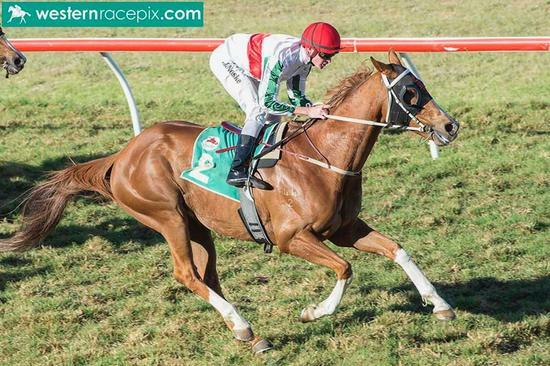 Gangemi Racing :: Red letter Day for "Big Tom"
Red letter Day for "Big Tom"
Forty Four Red (stable-name "Big Tom") delivered something very special yesterday at Northam with a dominant win over 1400m. Not only did the big gelding win easily by 2 lengths after doing a lot of work in the run, but his time of 1min 21.47sec also came with 0.3 seconds of the 1400m Track Record at Northam (held by Liberty Rise: 1.21.16 in 2016) !!! Sent out a pretty short favourite after his great previous run, the Congrats gelding (out of the mare Cataclopse - also mother of the very good "Super Eighty Eight"), Tom had to work hard from a wide barrier to get over and "face the breeze" outside the leader. It was a tough run, however, when stable jockey Jarrad Noske let him go at the top of the straight, he kicked away like a top-liner and eased down to win by two lengths over a nice field. Tom now takes his record to 21 starts for 3 wins, 5 seconds and 1 third and over $54,000 in stakes. He has been a great first horse for many of his owners that includes many of the "better halves" of our regular male ownership group! !